The father of BEBOP and the Dizzy Gillespie Biography introduces you to the "Daddy"! What do you call a dude who innovates jazz and keeps a cool look at the same time? A real 'JAZZ-CAT" thats what! Fifty years after helping found a new style of revolutionary jazz that came to be known as bebop, Dizzy Gillespie's music is still a major contributing factor in the development of modern jazz. Dizzy Gillespie Biography: John Birks Gillespie was born October 21, 1917, in Cheraw, South Carolina, to John and Lottie Gillespie. The last of nine children, Gillespie's father was abusive and unusually strict and the youngest Gillespie grew up hard and strong. It helped him to be a tough kind of dude in that old segragated USA. When Gillespie was ten, his father died and left the family in terrible financial trouble. Around this time Gillespie's English teacher introduced him to music, and he soon joined the school band. At first he played the trombone, but switched to the trumpet after borrowing a neighbor's and immediately falling in love with the instrument. Over the next several years Gillespie played with local bands—to both black and white audiences—until his family moved to Philadelphia, Pennsylvania. The kid was always smiling ands had a cool strut from the get go! In Philly and New York Gillespie played with bands in Philadelphia from 1935 to 1937 before moving to New York City. In Philadelphia Gillespie earned his nickname for his unpredictable and funny behavior. In New York City the Teddy Hill Orchestra hired Gillespie for a European tour. By 1937—when he was only nineteen—Gillespie had already made a name for himself among New York musicians, who could not help but notice his radically fresh take on solo (single) trumpet playing. The cat could play and his sound was off the hook! Gillespie made his first recordings with the Teddy Hill Orchestra just prior to leaving for Europe with "The Cotton Club Show." Having a foundation in Cab Calloway's band gave Dizzy the confidence to tretch out a bit and get hip with the jive of jazz! Gillespie joined the Earl "Fatha" Hines band in 1942, about the same time Charlie Parker (1920–1955) did. Although Parker became famous as an alto saxophonist, he was playing tenor sax at that time. Gillespie first met Parker in Kansas City, Missouri, in 1940 when he was on tour with Cab Calloway. The two of them jammed together at the Booker T. Washington Hotel for several hours. After leaving Eckstine, Gillespie substituted in the Duke Ellington (1899–1974) Orchestra for about four weeks, then formed his own group to play at the newly opened Onyx Club on 52nd Street. Gillespie had been playing bebop (a new, radically different form of jazz) whenever he could since 1940, the year he married Lorraine Willis. Now he was able to play it full time. 52nd Street became the proving ground for a new jazz style that had previously been played primarily at late night jam sessions. "The opening of the Onyx Club represented the birth of the bebop era," Gillespie recalled in his book, To Be or Not to Bop. 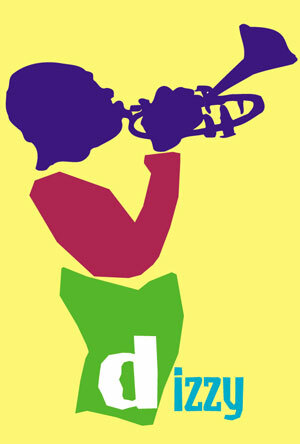 Dizz and Bird created Be Bop and they made the world listen to this outrageous music that challenged the listener to... LISTEN WITH YOU MIND AND EARS! 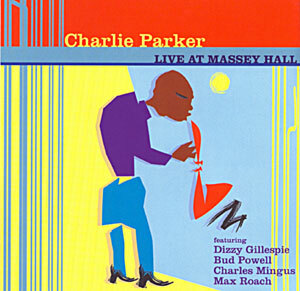 Gillespie's quintet and the presentation of modern jazz reached its peak in 1953—with a concert at Massey Hall in Toronto that featured Gillespie, Parker, Bud Powell (1924–1966), Max Roach (1924–), and legendary jazz bassist Charles Mingus (1922–1979). Not letting age slow him down, in 1989 Gillespie gave three hundred performances in twenty-seven countries, appeared in one hundred U.S. cities in thirty-one states and the District of Columbia, headlined three television specials, performed with two symphonies, and recorded four albums. The next year, at the Kennedy Center for the Performing Arts ceremonies celebrating the centennial of American jazz, Gillespie received the American Society of Composers, Authors, and Publishers' Duke Award for fifty years of achievement. Back to Dizzy Gillespie Biography and other Jazz Cats!